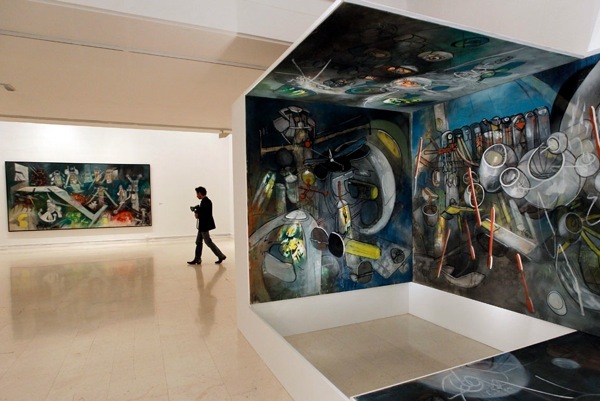 A general view of several works by Chilean surrealist artist Roberto Matta that form part of a retrospective exhibition celebrating the 100th anniversary of the artist's birth, at the Instituto Valenciano de Arte Moderno in Valencia. EPA/JUAN CARLOS CARDENAS. Today's post is a little bit of a guilty pleasure, and I say that because my fascination with painting really hit a massive surge when I was very young after I fell in love with Chilean Surrealist artist Roberto Matta. The strong graphic appeal of his work and the space-age, futuristic stylings of some of his paintings were a massive draw for me. I think that period of trying to get to know more about Matta's work, and being exposed to his creations has informed how I relate to art and the styles that I find most pleasure in now. Personal indulgence over, the reason for the resurgence of my fanaticism is that a retrospective of Matta's work has gone on show in at the Instituto Valenciano de Arte Moderno in Spain, to celebrate the 100th anniversary of the artists birth. This celebratory event comprises around 32 of Matta's paintings, which highlight the reasons why he is considered to be one of the greatest Surrealist artists of the 20th-century. He was integral to the continual development of Surrealism throughout the modern period and it's transference from Europe to America. Matta began traveling in Europe in 1933, after training as an architect in Chile, having the good fortune to meet and work with famed architect Le Corbusier. He arrived in Paris in 1935 and it was there that he honed the artistic skills and styles that we now associate with his work. He was very much involved with the artistic community in Paris, working with the likes of Picasso, Miró and Magritte, before he was invited to join the Surrealist movement in 1937, thanks to an introduction to leading Surrealist André Breton. His move to New York in 1939, at the outbreak of World War II, saw him bridge the Atlantic gap. His personality, innovative pictorial creations and fascinating technique meant that he received a great amount of attention from the American school, leading him to influence such important artists as Robert Motherwell, Arshile Gorky and even Jackson Pollock. As well as having had a huge impact on Surrealism, it's clear from these names that Matta also had a hand in encouraging stylistic developments in Abstract Expressionism, although Matta was never part of that movement. This retrospective in Valencia runs until the 1st May and is not one to be missed for anyone with an interest in Surrealism, or who would like to learn more about one of the most interesting and influential figures in 20th-century art.